The Abkhaz and South Ossetian conflicts did not emerge in the 2008 August war. However, they escalated in the early 1990’s when both territories engaged in wars of secession and there are different approaches to the resolution of these conflicts. For the EU, these are regional issues with broad security implications. However, from the viewpoint of the Georgian government, Abkhazia and South Ossetia are primarily internal political issues. Tbilisi claims both territories as integral parts of Georgia even though it has not been exercising full control over either entity for several years. Georgian public opinion supports government claims over these two territories. 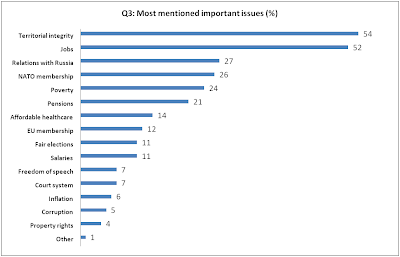 Data from CRRC’s 2009 survey entitled, “Knowledge and Attitudes Towards the EU” in Georgia shows that territorial integrity was the most mentioned issue of significance for Georgia. The question in this survey asked the respondents to name up to 3 most important issues facing Georgia without ranking. This methodology is different than that used in the Caucasus Barometer where respondents are asked to indicate the most important issue facing the country. Moreover, 43% of Georgians mentioned the restoration of territorial integrity as an important issue with which the international community can help. For example, many Georgians believe that issues involving territorial integrity (65%) and national security (68%) will improve if Georgia joins EU. This is in light of the fact that 46% of Georgians expect a major military conflict with Russia in the next 5 years and 80% of Georgians consider joining NATO to be an important issue (CB 2010). No approach to resolving these conflicts (e.g., neither the August war, nor isolation of both territories) has brought any resolution to date. 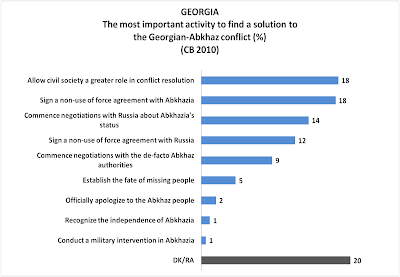 With regard to the Abkhaz conflict specifically, data from the CB 2010 shows that ideas about what would be the most important activity to resolve the Georgian-Abkhaz conflict is split between 18% of Georgians who would like to see greater involvement by civil society, 18% who prefer the signing of a non use of force agreement with Abkhazia, and 20% of Georgians who don’t know what would be best. In contrast to the Georgian view, the EU sees the cases of Abkhazia and South Ossetia as regional issues with broader security implications, rather than as internal Georgian problems. Many academic circles in the EU and USA suggest a policy of “engagement without recognition” towards Abkhazia and South Ossetia. For example, in the 2010 October edition of the Washington Quarterly, Lincoln Mitchell and Alexander Cooley wrote that “pledging enduring support for Georgia’s territorial integrity is somewhat meaningless” because the more both breakaway regions are pressured to choose between Tbilisi and Moscow, they will choose latter. According to them, the more these areas are isolated by the international community, the more likely they are to increase their dependence on Moscow. In addition, the European Union Institute for Security Studies suggests that the “engagement without recognition” policy might be beneficial for Georgia as well because it does not question Georgia’s territorial integrity, nor does it force Georgia to recognize the self-proclaimed independence of both regions. How do you think Georgia should deal with its "breakaway" territories?